Sometimes we just need to give our home a spruce up. Living in an organised and clean space helps us concentrate, feel happier and makes our lives easier. Although there many chemical products available for water stain removals, organic alternatives like lemons can be far healthier and less irritating to the skin. 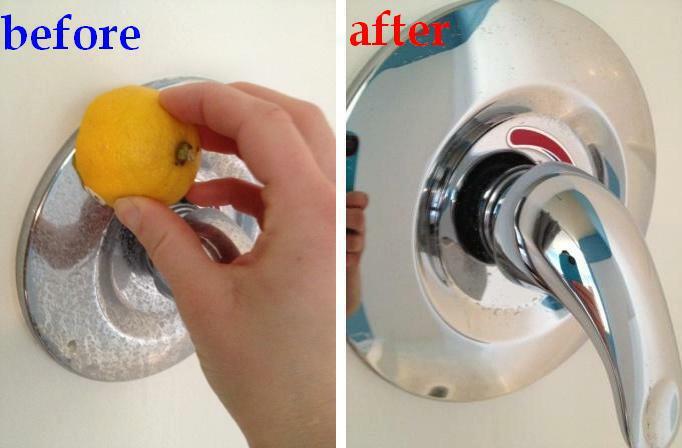 When cleaning hard to remove water stains from fixtures, cut a lemon in half and scrub the stains away. The citric acid from the lemon will work wonders. Rinse the area with water after. You can also use this trick on windows! Carpets hosts everything from dustmites, to human and pet hairs. Regular vacuuming cannot remove every stubborn hair that gets stuck. But if you have a squeegee for your car, windows or mirrors, you can use this to clean that carpet! Choose one that has a long handle to prevent you from bending over too much. Drag the squeegee across the carpet and the rubber head will loosen any embedded hair. It’s winter in Australia right now, so you can pack away all your tank tops and shorts! If you’re in other parts of the world, vacuum sealing your winter clothes is a great space-saving idea too. Sealing clothes like this may help preserve them from mildew and keep them in good condition for when you want to wear them again. Vacuum sealing is an easy trick you can do by yourself. You’ll need a vacuum and a large plastic bag made especially for vacuum sealing. Here’s how to do it. Fold your clothes neatly and stack them. Place them in a large plastic bag. Insert the vacuum hose into the bag but make sure it’s not touching the plastic. Watch the plastic shrink and see the clothes inside it flattening as well. Turn off the vacuum when done but make sure that you’re securing the plastic so it stays air-tight. You can tie it with a rubber band or use a heat sealer for a cleaner and more organised look. If you’re renovating, give your headboard a perking up like the gorgeous one shown above. But instead of turning it into the usual headboard, use it to store small things. The extra storage is practical and will help you organise your room. Those extra drawers look pretty and are functional at the same time. To avoid spreading germs all over your kitchen, start at the right side of your stove and go clockwise making the stove and oven the last place you clean. Since ovens house lots of dried food particles and grease, you will avoid spreading the germs by putting it as the last to-do. Use a vinegar soaked cloth when cleaning the stove or a baking soda dipped sponge. Vinegar is a great help around the home, especially when cleaning your sliding door tracks. After prolonged use or not enough use, you can remove dirt, dust and grime with the help of vinegar. Dip a cleaning cloth in white vinegar and begin wiping off the accumulated dirt. For hard to reach areas, you can use Q-tips dipped in vinegar as well. Finish off with paper towel. Instead of stacking your tea cups and mugs, you can start organising them with space-saving mug hooks. Install the hooks in your cabinet and hang your cups and mugs while you leave a big space for other crockery underneath. Nothing can sour your mood like a long rummage in the closet or drawer and not finding what you are looking for. To remedy this, fold your clothes so they are easy to see and grab. This will help you find clothing you are looking for easily and without the hassle. Plus it saves a lot of space. For items that are off-season, put them toward the back of the stack. When storing brooms, do not let them sit in the cabinet standing up. Instead, hang them to avoid distorting the shape of the bristles. This way, your broom will last a lot longer. Always start dusting from the ceiling to avoid repeating your cleaning process. Sweep your ceiling with a ceiling broom, dust your furniture and finally vacuum or sweep the floor to collect all the dust that may have fallen. Cover your furniture with cloth or plastic before cleaning the ceiling to avoid dirt settling in. Also, cover your broom with a towel or microfiber rag for better cleaning. Instead of jumping from one room to another, do one room at a time. Multitasking can do more bad than good. Seeing one room completely clean and organised will give you the right motivation to do another room in the next few hours or even the next day (there’s no rush). You can even enlist family help and make it one big family cleaning day. Have fun getting organised! Whether you’re in the gloomy winter months or not, a clean and organised home will make you feel great.